GM has promoted the $41,000 Volt as an electric vehicle to give it an image boost over hybrid-electric cars such as the Prius. DETROIT (Bloomberg) -- General Motors Co. is disputing accusations that its low-emission Chevrolet Volt is a hybrid and not a true electric vehicle a month before the car goes on sale. Auto critics Edmunds.com, Motor Trend, Popular Mechanics and others have said that during heavy acceleration the Volt uses its gasoline engine to augment power from the electric motors to drive the wheels. On its Web site, GM says the car is an extended-range electric vehicle, not a hybrid like Toyota Motor Corp.'s Prius. “GM's insistence that the car is fully electric is hard to understand in light of the fact that the gas engine provides direct motive power under certain conditions,” the New York Times said Monday. Doug Parks, a global electric vehicle executive for GM, told the New York Times that the automaker chose not to publicize the high-speed gas-engine assist feature previously to protect the technology during the patent application process. The Volt debate illustrates the marketing challenge for automakers selling new technology in cars that don't fit standard classifications and whose performance is difficult to measure. GM and Nissan Motor Co. have both made claims about their new models' fuel economy and driving range that not all consumers may attain because electric performance varies greatly by driving habits. The Detroit automaker has said for three years that the Volt would always run on electric power and more recently said it would average 230 miles per gallon. The U.S. Environmental Protection Agency hasn't rated that number, and GM said many consumers may get lower fuel economy. GM said Monday that the engine does assist in driving the car through an electric generator. According to the editors at AutoWeek, an affiliate of Automotive News, the Chevrolet Volt is an electric vehicle, series hybrid and parallel hybrid all rolled into one. For the first 25 to 50 miles it's an electric vehicle, running on the battery pack alone. Once the battery pack reaches its minimum charge, the 1.4-liter engine kicks in and turns a generator to feed electricity to the two electric motors -- or a series hybrid. At speeds of about 70 mph or more, a clutch pack engages which lets the 1.4-liter engine lend a hand and mechanically help turn one of the electric motors, while also generates electricity for the electric motors. That would make it a parallel hybrid by using two power sources to help move the vehicle. 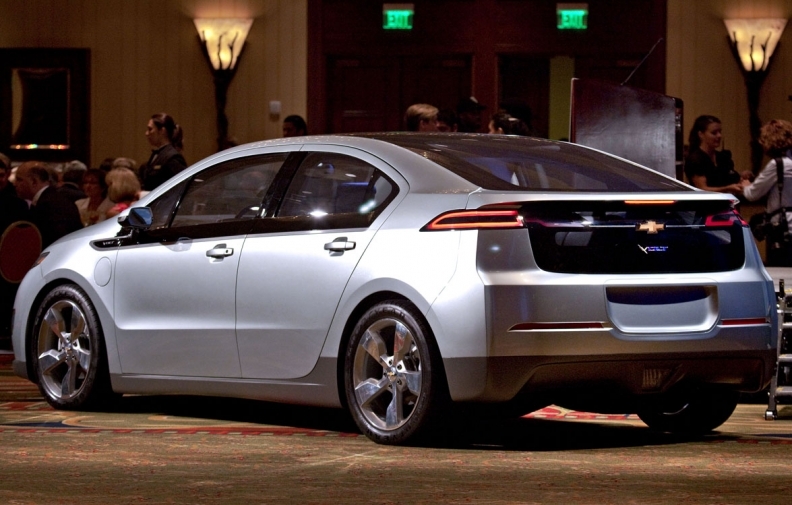 The new claims have arisen in recent days following the formal media launch of the Volt. For the first time, journalists are getting the opportunity to drive the Volt in all modes and driving conditions. Up until now, GM had allowed journalists to drive the Volt in electric-vehicle mode only. “GM has kept the complete functionality of the Volt a closely guarded secret until now,” said Bob Gritzinger, executive editor of Autoweek.com and who was among the journalists that drove the vehicle this week. Nick Richards, a GM spokesman, said the Volt always runs on electricity and has no mechanical link from the gasoline engine to the wheels. The car's four-cylinder gasoline engine powers a secondary electric motor, which turns the wheels, Tony Posawatz, the Volt's vehicle line director, said in an interview. The car's gas engine doesn't directly power the wheels, he said. GM never disclosed that fact because the engineers saw it as a benefit that boosted the car's fuel economy, he said. Hall, of 2953 Analytics, said there are some similarities between the Volt and the Prius. GM said previously that the Volt would go 40 miles on a fully charged battery before the gasoline engine starts to recharge the battery, giving the vehicle a total range of 340 miles. The company said this week it will go 25 to 50 miles in electric drive and 310 miles on one charge and a tank of fuel. Nissan and GM both will have marketing challenges when consumers experience lower range or fuel economy, Hall said. With hybrids and electric cars, they can drive farther in stop-and-go city driving than on the highway because braking recharges the battery. That means many Volt owners won't get 230 miles per gallon in the Volt and Leaf drivers won't get the 100 miles on a single charge that the companies have claimed, Hall said. Consumers probably won't care whether the Volt is a hybrid or electric car, said Eric Noble, president of The CarLab, an auto consulting firm in Orange, Calif. Potential buyers will be more concerned with the car's price, the fuel savings and how far they can drive before needing to plug in or refuel. The Volt's emissions are more important than what people call it, said Dan Becker, director of the Safe Climate Campaign, an environmental lobbying group in Washington.